Infectious diseases are the leading cause of death worldwide, so it is critical that we characterize exposure routes of infectious agents, including those resistant to antibiotics. The source of infectious agents is often attributed to the environment. But, few studies have explored what types of environmental exposure introduce opportunistic microbial pathogens or what actions may be taken to minimise exposure. Here, myself and Drs. Lutgarde Raskin and John LiPuma, have proposed a study to characterize the drinking water (DW) microbiome – from source to tap — and identify the factors (e.g. disinfection by-product residuals and pipe material) that regulate the microbial community structure. Such understanding will allow the manipulation of these factors to facilitate exposure to safe and diverse microbial communities and will allow strategies to be determined to reduce the risk of disease by selectively eliminating pathogens, such as those affecting immunocompromised people. Specifically, we will focus on linking the DW microbiome with the human respiratory tract (RT) microbiome, with a particular emphasis on opportunists found in persons with cystic fibrosis. 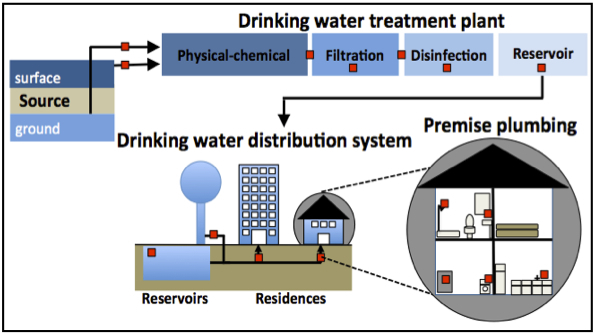 This interdisciplinary research alongside the work of our collaborators Dr. Ameet Pinto, Nadine Kotlarz, and Dr. Linda Kalikin will help generate ideas that support modifications in system operation, including at the household level, to positively impact DW microbial quality and will have far reaching consequences for the scientific, medical, public health and drinking water utility fraternities. I am excited and honoured to have been awarded the MoBE Fellowship from the Alfred P. Sloan Foundation and look forward to starting my research in November. I believe this will be a great opportunity to expand on my environmental microbiology and engineering background I have gained during my PhD research. Sarah Haig is a postdoctoral research fellow at the University of Michigan. Really interesting project Sarah. I look forward to hearing more about it.